No New Nakba! – Defend the Right of Return! If there is sufficient demand, a coach from Manchester will be organised. It would leave from Chorlton Street Bus Station at 7am and return to Manchester at approximately 9:30pm. 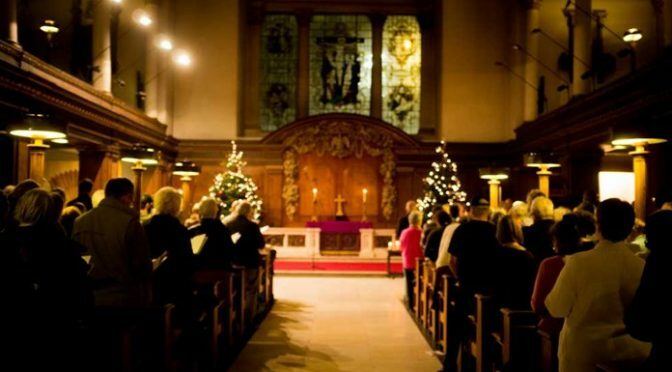 Coach tickets are likely to be £30 (£15 concessions). If you or your organisation would like coach tickets or would like to sponsor seats on the coach, please could you email back to contact@psc-manchester.org.uk by April 25th indicating the number of tickets. The Palestinian people need our solidarity more than ever, and are calling for global protests to protect their collective rights. As Israel continues to flout international law and violate human rights, there is a responsibility on the global community to hold it to account and push for an end to the oppression of the Palestinian people. National Demonstration Exist! Resist! Return! 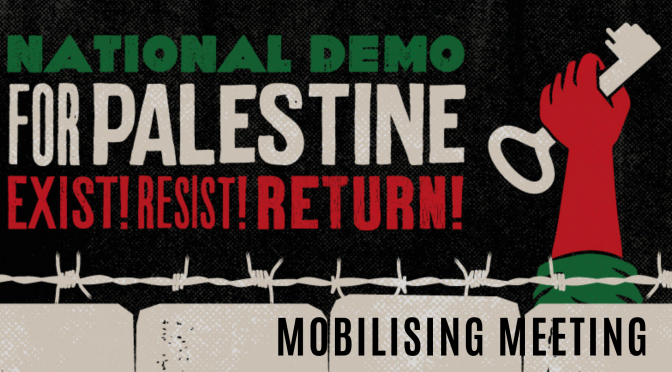 Saturday 11th May organised by: Palestine Solidarity Campaign, Stop the War Coalition, Palestinian Forum in Britain, Friends of Al- Aqsa, Muslim Association of Britain. Supported by: Unite the Union, PCS, UNISON, RMT, ASLEF, UCU, Amos Trust, CND. 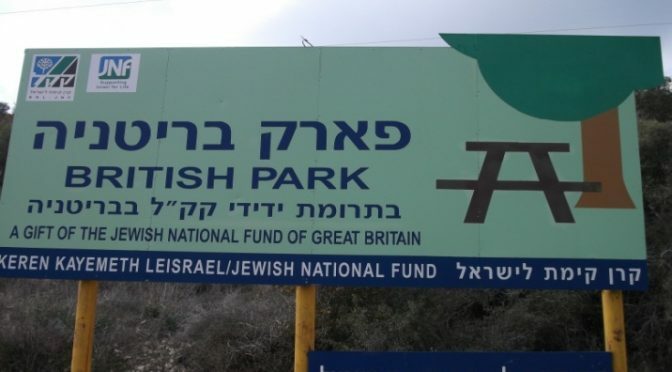 Picture above: Sign for JNF UK funded British Park built on the ruins of Palestinian villages ethnically cleansed in 1948. In 2018, Kholoud al Ajarma appealed to the Charity Commission that the JNF UK should not be recognised as a charitable organisation as the JNF funded British Park is built on her family’s village, Ajjur. Her family still have the title deeds to their land in Ajjur. The Charity Commission rejected her claim. At an independent tribunal, Kholoud will be challenging the Charity Commission’s refusal to end the JNF’s charitable status that entitles the JNF to receive UK tax relief. Her appeal is supported by the Palestine Solidarity Campaign (PSC). Come and hear the case for de-registration of the JNF UK . The meeting is part of a PSC national speaking tour in support of those challenging the JNF’s charitable status. Biography Kholoud al Ajarma belongs to one of the families ethnically cleansed from Ajjur in 1948. Today, they live in Aida Refugee Camp, Bethlehem, only about 25 miles from their village. The family still have the title deeds to their land in Ajjur. Kholoud has studied in England, Holland, Norway and Morocco, but says the Right of Return is the real work of her life. March 30th will be the 1st anniversary of the start of the Gaza Return March. March 30th is also Palestinian Land Day. Palestinians have issued a call for international action on the day. Join the protest on Saturday 30th March at 12 noon. We will be demanding an end to the siege of Gaza and the right of return for Palestinians. Defend the Right of Return! March 30th is Palestinian Land Day – when Palestinians across the world remember the unarmed protesters killed by Israel in 1976 during demonstrations about Israel’s theft of Palestinian land. This year, March 30th also marks the the 1st anniversary of the start of the Great Return March. These ongoing protests, taking place every single Friday, have seen thousands of Palestinians demonstrating for their right of return to their villages and homes from which they were forcibly removed. Many have been irreversibly injured and even killed for doing so by Israeli snipers. 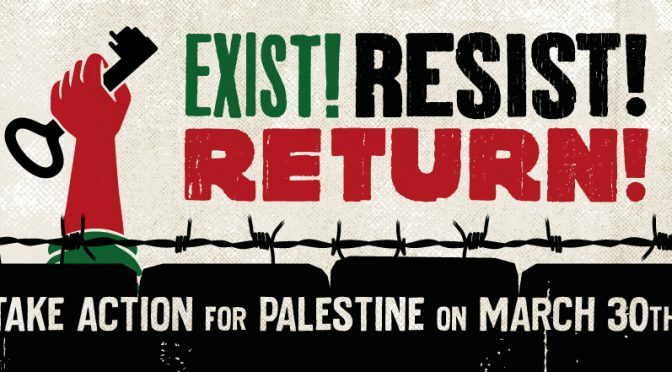 So join us on Saturday March 30th at 12 noon to show support for the Palestinian people and their rights to EXIST, RESIST & RETURN! 30th Mar 2019 12 noon Piccadilly Gardens, City Centre, Manchester. The 14th Tom Hurndall Memorial Lecture will take place on Monday. It will be given by Salma Karmi-Ayyoub on Monday 25 March 2019, 6.30-8.00pm at Manchester Metropolitan University in Brooks Building Lecture Theatre 1. The title of her lecture is ‘Israel’s Nation State Law and consequences for Palestine’. 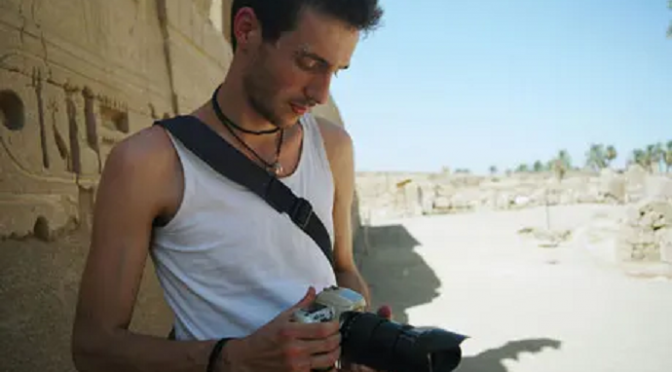 Tom Hurndall was a student at Manchester Metropolitan University (MMU). He was fatally wounded by the Israeli Defence Force whilst protecting Palestinian children in Gaza. He died on January 13th 2004. Since 2005 MMU has hosted a Memorial Lecture which has attracted prestigious figures willing to speak out against what was done in 2004 and what is still being done now by the Israeli State. For more details about this lecture and previous lectures, visit the Tom Hurndall Memorial Lecture page on Facebook. The organising group for the lecture is from MMU and Manchester University. Musheir El-Farra (Chair of Sheffield PSC) has just returned from the Gaza Strip. He will give an illustrated talk about his visit focusing on the ways in which popular resistance to Israeli’s siege is developing despite the severe hardship people are experiencing. 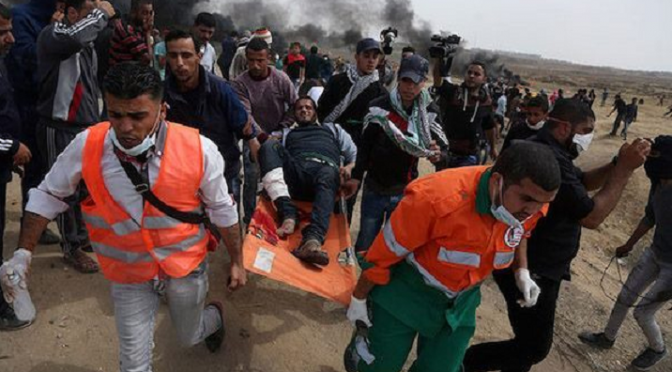 Since the peaceful protests began along the Israeli-Gaza border on March 30, 2018, Israeli forces have killed over 200 Palestinians and wounded more than 7,000 people with live ammunition. Coinciding with the month of Valentine’s, Cinema Palestino and Creative Interruptions are showing three Palestinian films that explore experiences of romantic love, love of family and love of home when living under occupation and dispossession. 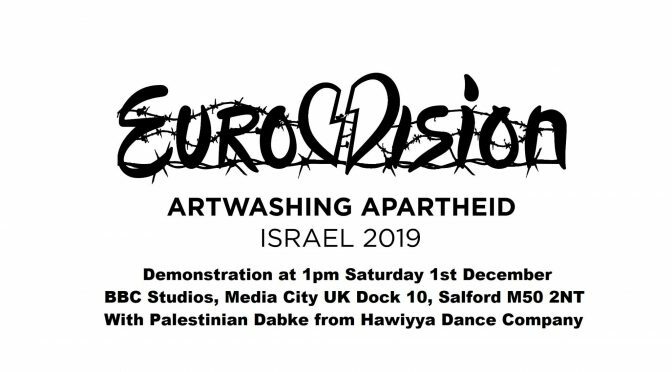 The staging Eurovision 2019 in Israel in May is being used to art-washes Israel’s violations of Palestinian Human rights. 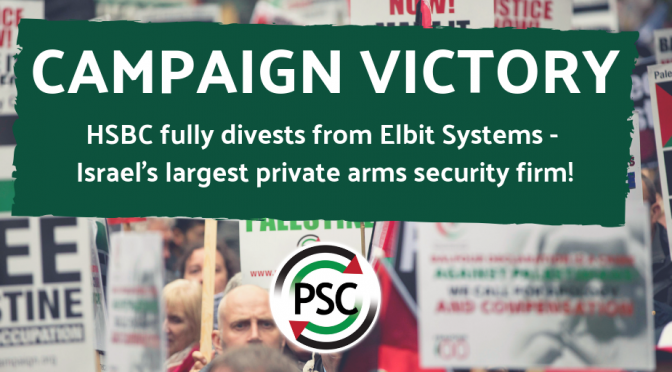 Below is the press release from PSC regarding HSBC’s divestment from Elbit Systems. Manchester PSC next public meeting is with Huda Ammori, Palestinian activist and PSC campaigns officer. 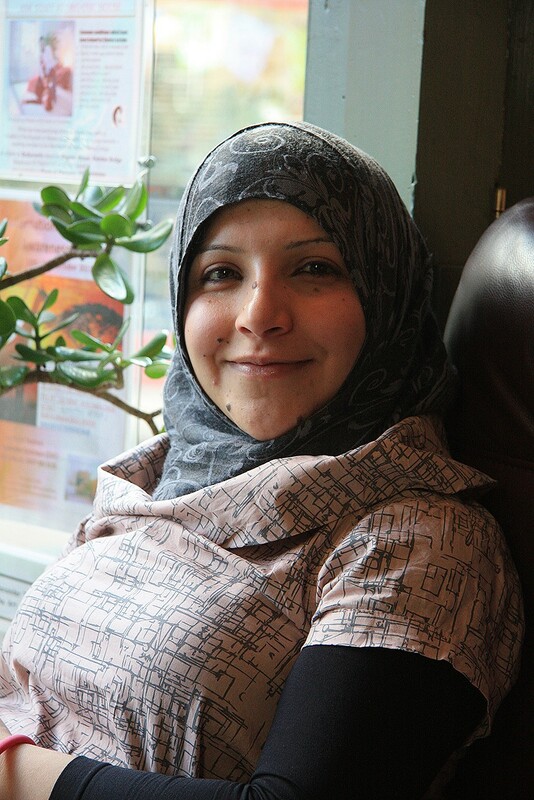 Before moving to PSC national office,she was a BDS campaigner at Manchester University. 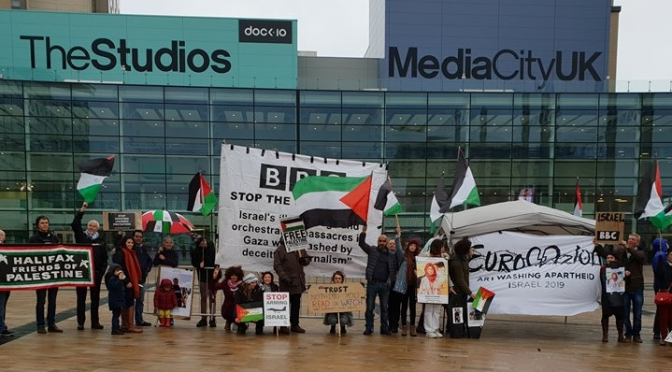 Join the protest at the BBC Headquarters in Salford Quays against 2019 Eurovision Song Contest being hosted by Israel. 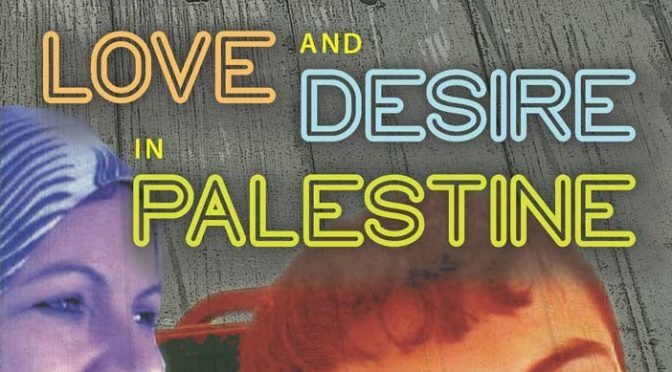 A Programme of 3 Films "Love And Desire In Palestine"